When my kids have a day off school, I love to find new and silly things to do in and around Toronto. This past Friday, I woke up and declared that we would have the Greatest Friday Ever. I packed them in the car and drove straight to the Clifton Hill tourist area of Niagara Falls. I had no plans or intentions to buy any sort of day pass but upon arrival we decided to try out the Niagara Falls Clifton Hill Fun Pass. Here’s my review of it and suggestions for a day off in Niagara Falls, Canada. First things first you will need to find parking. Lots in and around the falls range from $5 with a decent walk or $18 to exit your car and get wet by the spray coming off the falls. 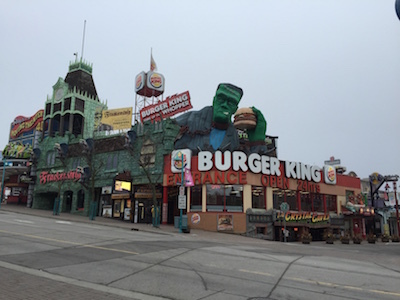 I found a $10 parking lot that worked perfectly for Clifton Hill fun. Located right off Clifton Hill and behind the Comfort Inn, the parking lot is huge and seemed secure. When we arrived and when we left it was packed with people and I suspect it would be hard to attempt a car break-in with the staff on-site. The staff was kind, knowledgeable and even accept credit and debit. As soon as you exit the parking lot, you realize there is a lot to do on this strip. My kids were already begging to hit the Sky Wheel, which to be fair is a much nicer version of past Ferris Wheels. I am not huge on Ferris Wheels so I suggested mini-golf to start. 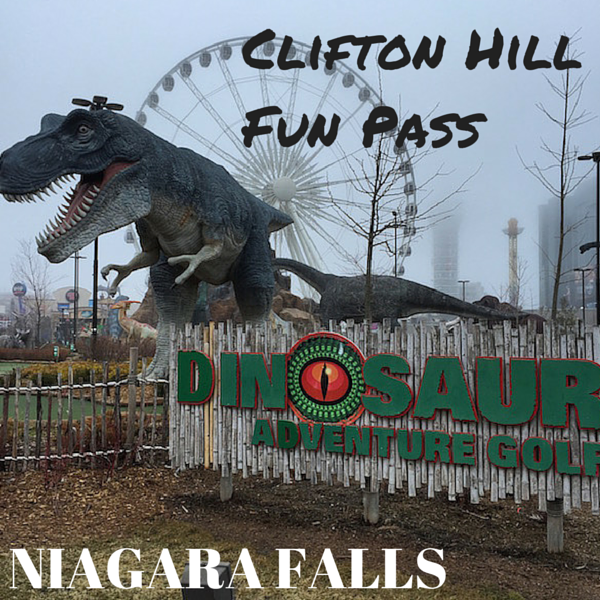 We headed to the gates of Dinosaur Golf and that’s where we discovered the Niagara Falls Clifton Hill Fun Pass. To Fun Pass or Not to Fun Pass? That is the Question. 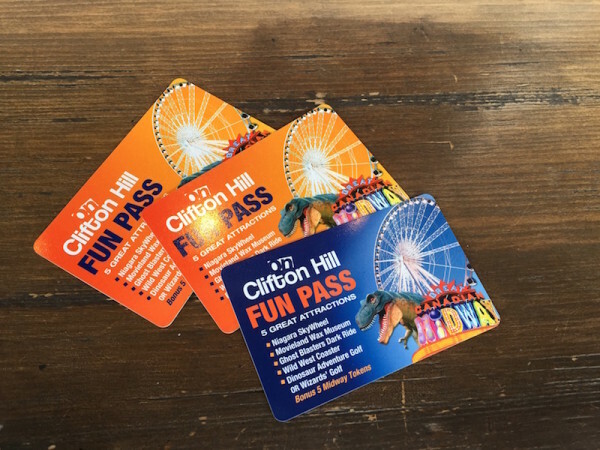 The Niagara Falls Clifton Hill Fun Pass sells for $25.95 per adult and $19.95 per child which means you can save up to $25 by using the pass if you choose to visit every attraction. We didn’t visit the Movieland Wax Museum of Stars (just not our thing) and found that the Great Canadian Midway would not provide the 5 tokens promised when presented with the fun pass. I instead spent $20 on tokens and used in additional coupon I found in a brochure for $5 of tokens free. What I loved about the fun pass was the sheer convenience of using them. You are given cards with barcodes and upon entering attractions, you simply scan the code and enter. I loved not having to pay at every attraction or wait in line for tickets. This proved particularly helpful at the Niagara Falls SkyWheel as we strolled past the long ticket line and were on the ride almost immediately. I am petrified of Ferris Wheels. Seeing I’m the only adult on most of our trips, I try not to let me fears stop my kids from trying new things. 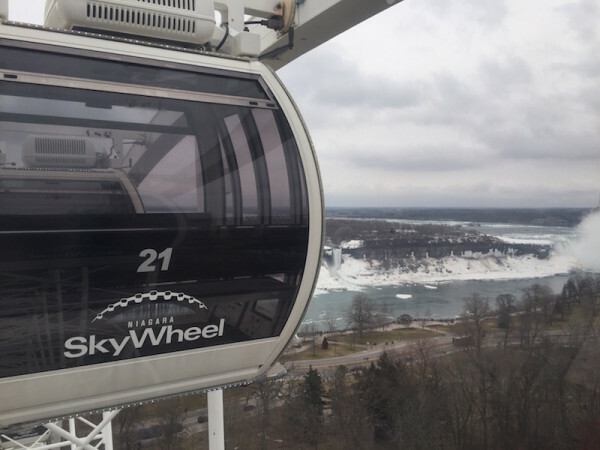 The nice thing about the Niagara Falls SkyWheel is that its actually an observation wheel. What’s the difference? It looks a hell of a lot better constructed and features fully enclosed air conditioned cars with ambient music. My review of the SkyWheel is that its actually incredible. You are on the ride for at least 3 rotations and getting on and off the ride is quick and easy. The view from the SkyWheel is incredible and it gives your kids a great view of the actual Falls and the rushing water surrounding it. Whether or not you purchase the pass, its a do not miss experience. 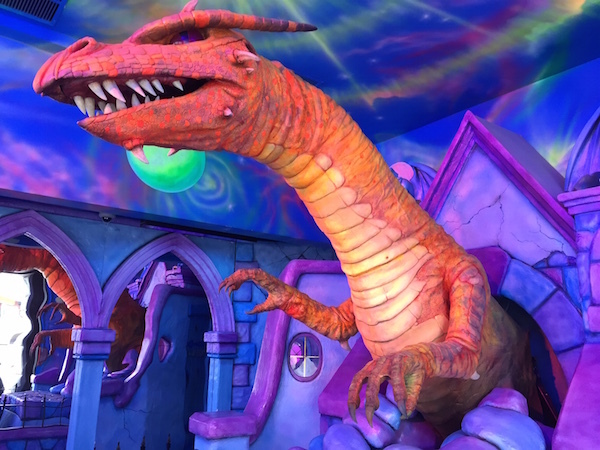 On the pass you have two options for mini golf: (1) Wizard Golf or (2) Dinosaur Golf. They are both really cool. Dinosaur Golf features an outdoor course with huge dinosaurs and adorable dinosaur babies. Wizard Golf is indoors and has a Harry-Potter-esque feel to it. We choose Wizard Golf in the morning as it was still quite cold outside. My recommendation on this decision is to choose based on weather and how busy the courses are. You can’t see the Wizard Golf course but we asked the man working if it was busy and he knew exactly how many people were inside at the time. Later in the day we walked around the Dinosaur course and will certainly return to play soon. Although we never figured out the 5 token thing, the Great Canadian Midway is a lot of fun and worth buying the pass for. Kids will love the two rides included in the pass, the Wild West Coaster and the Ghostblasters Dark Ride. I would say that both are suitable for kids over 3 but depending on your child you may want to check them out first. The Wild West Coaster is not a coaster but a 6D theater ride experience. My kids absolutely loved it and I thought it was very cute and fun. The Ghostblasters Dark Ride is a typical shoot lasers at targets to make dead things move ride. Still, we loved it and would recommend it for some good ole fashion fun. The midway itself is huge and worth trying a few arcade games you won’t really find elsewhere like the old midway games. What’s Missing for the Niagara Falls Clifton Hill Fun Pass? Two words. Laser Tag. 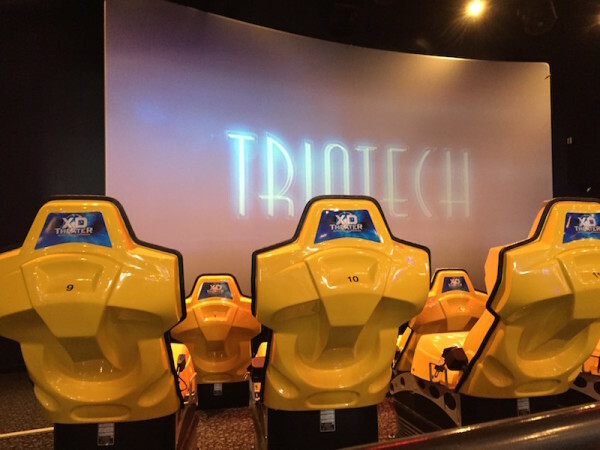 Niagara Falls has a bunch of arcades that all offer laser tag. Frankly, it was the most fun we had all day. There is one in the Great Canadian Midway but we by chance happened to go to Captain Jack’s which is now called the Clifton Hill Fun Center. Trust me just look the the Captain Jack’s sign. 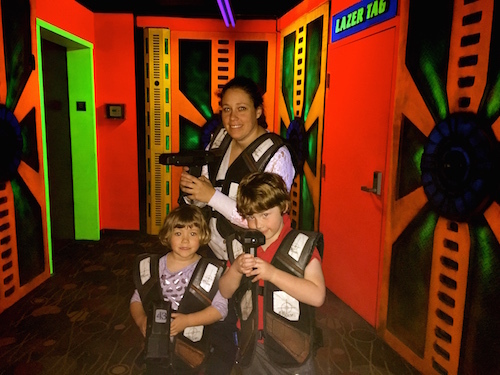 Although they had a variety of combos and passes for their attractions within the arcade, we opted for the single pay laser tag. We were suited up and given 10 minutes to assassinate each other with lasers. Your kids will love chasing you around and shooting at the targets on your front and back. I loved watching Charlie running in all her gear laughing hysterically and mostly shooting herself. Go play laser tag. You won’t regret it. Is the Niagara Falls Clifton Hill Fun Pass Worth It? Yes. For sure it is. 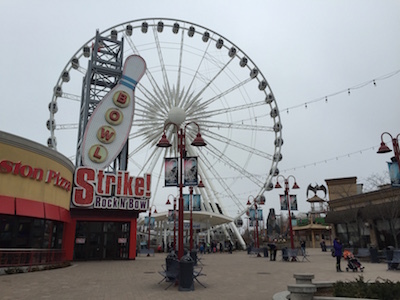 The minute your kids arrive on Clifton Hill, you will realize the chances of you getting out of there without playing one round of mini-golf or riding the Sky Wheel are nil. 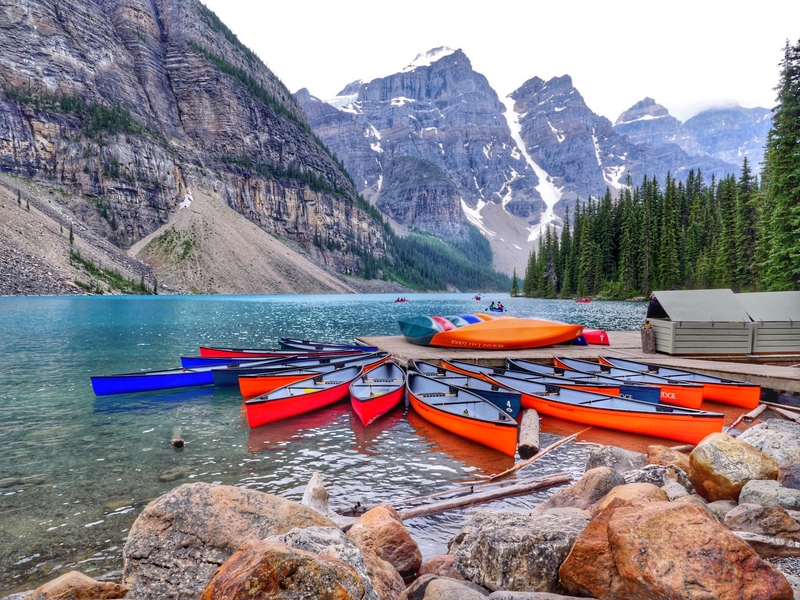 The convenience alone of paying once and getting to try all the attractions makes the pass worth it. 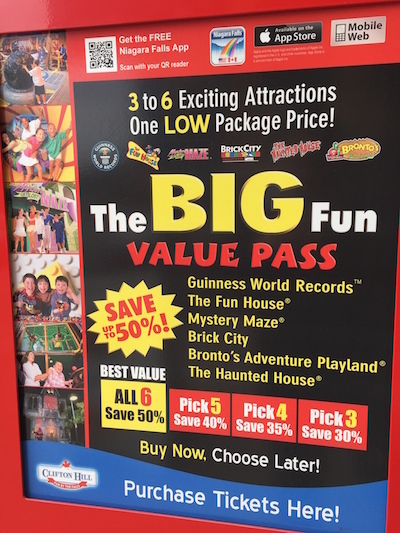 About half way through the day we discovered another pass called the The Big Fun Value Pass. A 6 pack pass is offered for $29.99 per adult and $24.99 per child. Here’s the thing…3 of the 6 attractions burned down in a fire and are currently closed. The price has been reduced for the 3 remaining activities but we tried one and were very disappointed. We entered a big colourful house called the Fun House which promised 8 interactive rooms. Besides a room with Fruit Ninja most of the other rooms were missing the fun element all together. We made it in and out of the house in about 4 minutes. The cost was nearly $30. Definitely skip it and tell your kids its my fault. Don’t be fooled by the pictures, they look nothing like the inside of the Fun House. Ready for some fun on Clifton Hill?